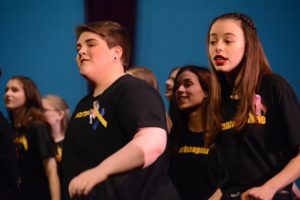 The Alexandria Harmonizers will host its annual Youth Harmony Festival on Friday, April 5, 2019 in Alexandria, VA. This all-day workshop/show is open to any middle and high school students in the DC Metro Area, and expert teachers and practitioners will teach them to sing and perform in four-part a cappella harmony. Also, the structure is set up for anyone to have a singing experience for the day with a cappella music. Therefore, we encourage all Chorus students, whether they belong to an A Cappella group or not, to participate. Either Mrs. G and/or Mrs. McCormick will attend the workshop with them, and we can organize school bus transportation. Also, April 5th is a teacher workday, so you won’t be missing class. If you would like to participate, please register online ASAP at www.harmonizers.org. Once you register and get your confirmation email, we highly recommend that you join their CLOSED Facebook group for this event. Only confirmed registrants will be approved to be in the Facebook group. Choosing a voice part — If you wish to just identify as S, A, T, or B, that is perfectly fine. When accessing the learning media, these guidelines might help: Lead would be equivalent to Tenor II for boys or Alto 1/Soprano II for girls. Soprano I for girls would likely be barbershop Tenor. Bass I, Tenor II, or Alto could also sing barbershop Baritone. And Bass is Bass (or Alto II)! If, once you hear the learning media and decide the selected voice part isn’t comfortable for you, you are free to learn a different voice part. The Preferred Name field is optional — if you are typically called by a nickname, middle name, etc. It’ll also appear on your name tag. Media/PDFs — Learning media for the songs for the event, as well as a PDF of each one, will be posted soon. All students should print out the combined song and EITHER the men’s or women’s chorus song (each student will learn TWO songs), and they should download the learning media specific to their chosen voice part. The registration fee ($20 through Feb 1 & $25 after 2/1) covers the cost of consumables for the day. Please make checks payable to PCA, place it in an envelope and send it in as soon as possible. Be sure to write your name and what the check is for on the envelope. The Alexandria Harmonizers is a renowned men’s a cappella chorus founded in 1948. For more information, visit: https://www.harmonizers.org/.